At long last I am able to offer my home grown pork for sale! Fresh Pork that was raised right here at Hillside Homestead. I have 3 pigs available for purchase. They were raised right here on my small farm with feed that was grown in Grand Traverse County and purchased from Send Brothers in Williamsburg, Michigan. I supplemented their regular ration with scraps from my kitchen, cherries (seconds that were discarded for imperfections) and lots and lots of windfall apples and a few pears. They will be butchered on Monday Nov 3, 2014 at Ebel’s in Falmouth, Michigan a USDA approved facility, http://ebelsgeneralstore.com/. The meat will be available about a week later. There are two ways to order, a side of pork (a half of a hog) or individual cuts. Home-grownh pork for sale at Hillside Homestead! 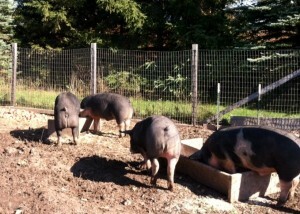 These hogs lived a good life and ate well on a small farm. A side of pork will yield about 75 to 100 pounds on my hogs. There are two fees to pay. The first fee goes to me, the farmer for raising the meat and that fee is $300 per side of pork. The second fee you pay directly to Ebel’s for butchering and processing your meat and their fee will range from $200-$300 depending on your order. If you are interested in a half a hog fill out this cut sheet http://ebelsgeneralstore.com/docs/guides/pork.pdf. I will deliver your pork free of charge if you live in Leelanau or Grand Traverse Counties. Please contact me with questions, I am glad to help. This entry was posted on Wednesday, October 29th, 2014 at 4:05 pm and is filed under Hillside Homestead News. You can follow any responses to this entry through the RSS 2.0 feed. Both comments and pings are currently closed.